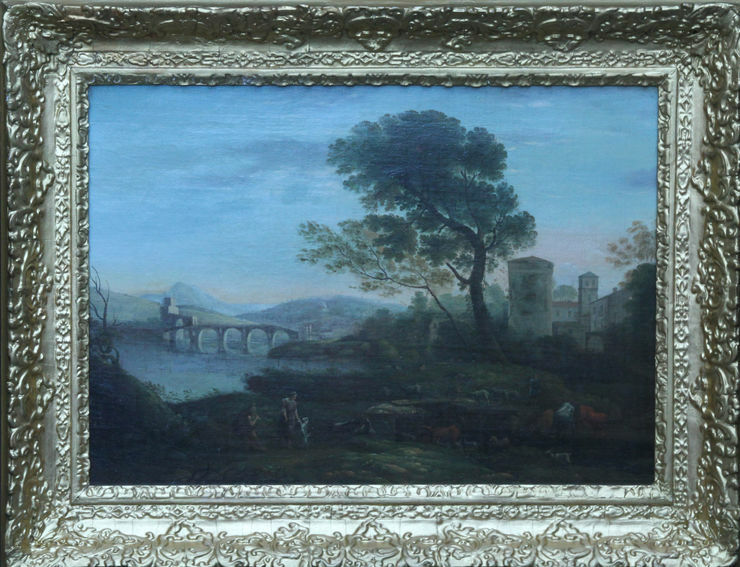 This fine Old Master 18th century Flemish oil painting of a classical landscape is by the circle of Jan Frans van Bloemen. In the foreground are figures with numerous cattle, sheep and goats. Behind are dwellings with a bridge over a river. The painting is bathed in the soft light Orizzonte was famous for and it is housed in a period gilt frame and dated to circa 1730. Housed in a complementary gilt frame, 30 inches by 23 inches and in good condition. Jan Frans van Bloemen (1662-1749) was a Flemish landscape painter mainly active in Rome. 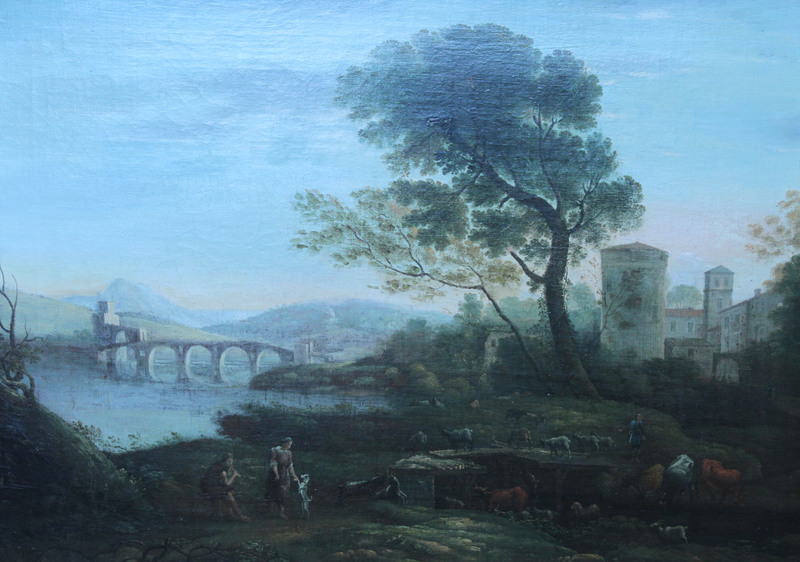 Here he was able to establish himself as the leading painter of views of the Roman countryside depicted in the aesthetic of the classical landscape tradition. After moving to Rome in 1684, the Flemish Jan Frans van Bloemen belonged to the circle known as the Bentvueghels, which brought together the Nordic artists residing in the Eternal City. His comrades gave him the surname Orizzonte because of his skill in creating misty atmospheric perspectives. His compositions, which mirrored the naturalism of Gaspard Dughet (1615-1675), soon became highly appreciated by a distinguished Roman clientele, including the Ruspoli family.